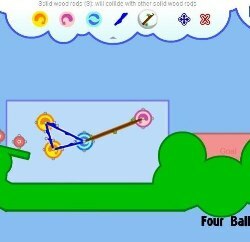 Test your construction skills and build bridges to get your workers across the valleys and back safely. You have to stick to your budget and use the materials at hand to complete each of 12 Christmas themed levels. 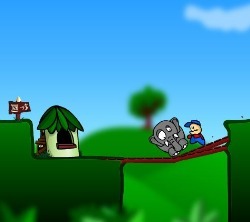 To pass each level your workers must reach the other side of the valley, collect all the items, and bring them back to the other side safely. Get a higher score by using less materials and saving money. 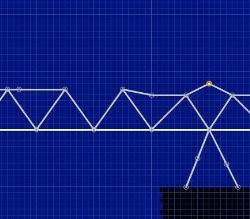 Use the MOUSE and LEFT MOUSE BUTTON to 'design your bridge', then drag out bridge beams for your bridge, then 'test your bridge' to see it in action. 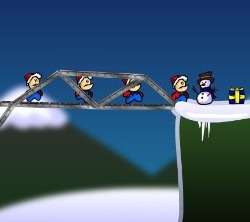 Click here to send Cargo Bridge : Xmas level pack to your friends using your default email program.